Zimbabwe is trying to take full control of its diamond mines. Last month, the government ordered the companies operating all but two of the country's mines to halt activity and vacate the premises. It wants to bring them under a new state-run entity. The companies have gone to court to try to block the moves, or at least to negotiate compensation. The dispute could spell more problems for the country's already troubled economy. Zimbabwe is one of the world's top 10 producers of gem diamonds. 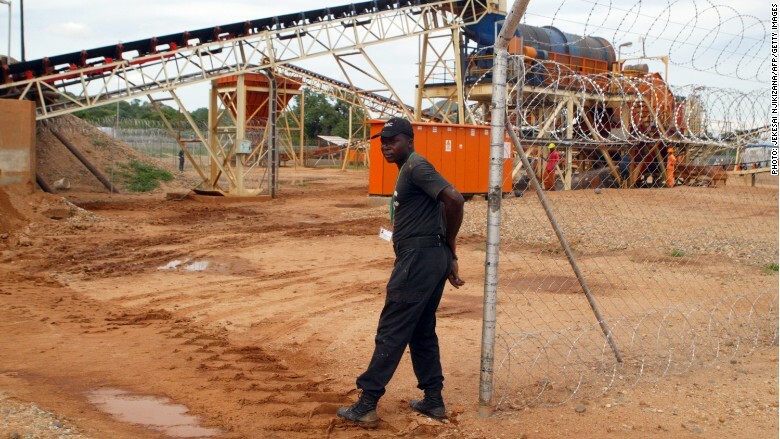 Revenues from the industry still account for about 30% of government income, even though they fell to $300 million in 2015 from $678 million in 2013, according to Mines and Mining Development Minister Walter Chidakwa. The government says licenses to operate the mines expired as far back as 2012. That, and the companies' refusal to partner with the new government-run Zimbabwe Consolidated Diamond Corporation (ZCDC), prompted the decision to close the mines, Chidakwa told CNNMoney. The government has offered a 50% stake in ZCDC to the mining companies, divided between them based on the size of their assets. Chidakwa said that would give them access to all tapped and untapped diamond reserves. The mining companies say the government was responsible for renewing their permits. And they don't like the ZCDC offer. Ramzi Malik, managing director of Diamond Mining Corporation, described it as "absurd." "If I get a 4% share of a company that doesn't make me an owner, it makes me a silent partner," Malik told CNNMoney. Malik is worried that the companies will be required to cover the cost and risk of developing new mines via the ZCDC, while having to share the returns with the government. "I would have to capitalize these new untapped resources. If I invest $10-$20 million in a new mine I would want to have a big share," he said. But the government appears to be in no mood to compromise. All diamond assets are being transferred to the ZCDC, and Malik is left trying to negotiate with the government to recover some of the $41 million his shareholders invested. Meanwhile, six mines are closed and government revenues continue to dry up.